One of the big reasons I started reading the Twilight series was because there was SOOO much talk about them in the Unity Forum. It seemed like everyone was reading them and everyone was loving them. I opened the book because I was curious to see what the hype was. And then I was hooked. So, I guess it's only rightful that when Angela issued a Unity and Twilight challenge, I would HAVE to do it. The challenge was to make a card inspired by any of the book covers and to use Unity Stamps. This was a bit of a challenge for me since the covers are so sleek and minimal. I really wanted to stay true to that and I really wanted to make a very romantic card. And that was a challenge since many of my stamps tend to be on the more cutesy side. I'm just a cutesy stamp kind of gal. I think I was pretty successful with this card. I love it! I think it is exactly how I wanted it to be. Clean. Sleek. Minimal. Romantic. This may be my favorite card you've created. LOVE IT! Wow Ashley!! I LOVE this!!! Very chic and elegant and GORGEOUS!! This is my fave too!!!! Just perfect! Ashley, I really love this! Nice job. I love the bright red against the black and the twisted ribbon. You're inspiration served you well! That turned out great! I am an addict of the Twilight Series, too! My daughter and I cannot wait for the movie!!! Wow! 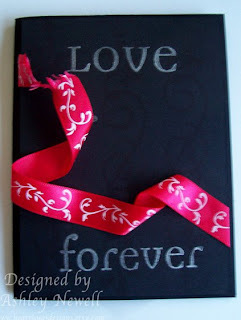 I love the effect of the red ribbon against the black background...simply stunning! Great job with this challenge! A stunning card. Wonderful work.